A band with arabesque tendrils borders a wide inscription. The tendrils are set into lozenges and triangles, alternating blue and red and embroidered in couching stitch. 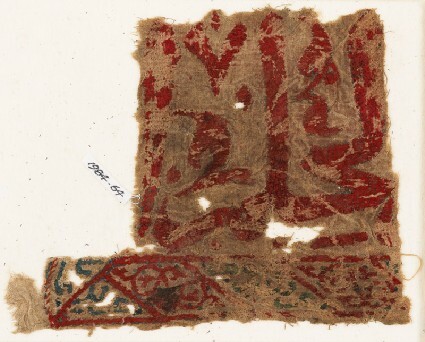 The inscription reads 'al-hilm'; it is red, embroidered in couching stitch, with remains of blue outlines in stem stitch. The large scale of the inscription suggests that the original fabric was to be displayed rather than worn as a garment. Laid threads are couched down over surface satin filling stitches. Outlines are worked in stem stitch.